See How You Can Get Bank Teller Jobs In Nigeria.The need and importance of job among graduates and school leavers cannot be over emphasized. Bank Teller Jobs: Generally in this part of the world specifically Nigeria, people go to school for the soul aim of making and graduating with good grades so as to guarantee a good job afterwards, to at least put food on ones table, take care of dependent relatives, improve and enhance living standard as well save for the rainy days. Banks being one of the largest employers of labor, the quest and rate at which people tend source bank teller jobs in Nigeria is on the rise. 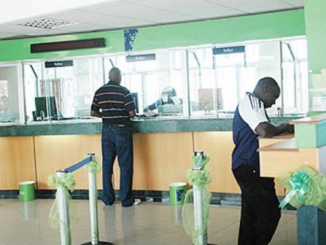 The said job however has continued to be in limited supply, harsh economic realities and government policies are beginning to affect banks which in turn stiffens the availability of these jobs further. This has been against the back drop of time when banks go to various tertiary institutions to conduct test for students, pick the best then offer automatic employment. For the interest of those who may be hearing this for the first time, I deem it pertinent and necessary to explain key terms as I take you into this great journey of discovery that will apparently improve your job haunting as well position you for a better opportunity. Who is a bank teller? This is an employee of the bank who deals directly with customers, they are normally the front line associates you meet, in fact they are the first people you interface with in the bank. They include: The customer service officers, the cashiers who receive deposits and pay withdrawals and so on. >They cross sell and promote the banks product, you get to hear about most bank latest products/inventions through these Tellers. 1. You need to be customer centric: This simply interprets that you must have love for your customers, being able to attend to them with a smiling face genuinely not pretentiously at all times under every situation is an obligation you are required to live up to. The bank believe so much in their customers and as such will not tolerate any shortfalls on your path towards service delivery, and truth be told you are the brand ambassador. In fact the bank will rather have you lose your job than lose a single customer. There’s no second chance to correct the first impression, you are required to get it right the first time, as such you must be at your best at all time, pay attention to the immediate needs of the customer while being able to prevent fraud that may arise as a result of such transaction. 2. Good and sound analytic ability: You are required to have good knowledge of basic mathematics as your daily task will be centered around calculations, addition, subtraction , division and multiplication of numbers to get desired result. 3. You must have sound knowledge of computer: Gone are the days banking is being carried out on note books or ledger. You must appreciate to understand the fact that 98% of your routine daily tasks are computer based. You will need to provide customer account balance, check customer’s relative financial information, reading and sending office emails, responding to enquiries, posting deposits, sending reports, ATM GL reconciliation, paying withdrawals, filing and retrieving records etc to mention just a few. 4. You must be tolerant and patient: To get bank teller jobs your ability to tolerate customers from all walks of life brand you a service champion. It has been observed that most tellers lack categorically this virtue and at some points leads many tellers to losing their job. Some customers are can be very annoying and rude, their arrival gestures alone can put you off your senses, but it’s not about you, it’s about the brand you are representing, it’s about the product under your custody and you are expected to swallow hook line and sinker. If a customer insults or engage you in words it is expected that you show high level of discipline in anger management, it’s not easy as it sounds but do all you can if possible pretentiously smile and pacify the customer. That way, you can win the customer politely and they could apologize thereafter for their misconducts. 5. You are expected to empathize with customers: When they come laying their complains, allow the customer to say it all and do not stop or interrupt them, give a listening ear to capture and understand what they are trying to say to avoid asking questions that could seem embarrassing to the customer yet an indicator that you weren’t listening while he/she was laying complain. That could lead to lose of confidence, empathy is a skill in bank teller jobs you must have. You must start by rendering apology no matter whose fault it is, put yourself in customer shoes that way you will meet their needs. 6. Good Communication skills: Tellers must have good writing, speaking and listening skills. You must have great communication skill to apply for bank teller jobs. You should be able to speak fluently as majority of the customers are well schooled and highly intelligent. Like I said earlier, you are the brand ambassador and high level of expectations befall on you. You’ve got to speak good English free of grammatical blunders if the customers must take you and the bank seriously at every point of business especially at the customer service point. It’s generally a heinous crime to fall short of this expectation. You should be able to write in clear and error free terms to convey your information accurately to every department concerned. A good listening skill is an added advantage having being stressed above for bank teller jobs. Like any other job, it’s expected that you must have gone through school with at least a minimum qualification of (OND) Ordinary National Diploma obtained from Polytechnics. Some banks will consider (NCE) National Certificate for Education usually obtained from a colleges of Education. (HND) Higher National Diploma as well. But the most salable is the OND of which the reason is an open secret, It’s no longer a news that Banks are in search of cheap labor putting the harsh economic stand into consideration. You will agree with me they use Polytechnic products more than University, the reason is this: Bank teller jobs are contract jobs outsourced to recruiting firms, you are being recruited by these firms then seconded to the designated bank, it simply means you are not a full staff of the Bank I don’t mean to discourage you at this point but to put a record straight. Consequently some banks no longer employ OND holders, they now have a minimum of HND e.g Guarantee Trust Bank and Access Bank others will soon join. As a matter of fact Their HND holders have been mandated to get their Bsc certificates within a time frame otherwise risk being relieved of their job. BANK TELLER JOBS: WHERE CAN I SUBMIT MY APPLICATION? Usually for a bank teller jobs you do not need to submit your application to the bank or its career portal. Avoid such practice, should anyone receive it from you, it will end up in the waste bin. Like I said initially teller job is a contract one and this you must understand from day one. This job is contracted to outsourcing firms who basically employ you then you get seconded to the bank. And should anything go wrong on the course of your employment, the bank will return you to your employer which supposedly is the outsourcing firm. Note: You must have applied on their website www.icsjobportal.com before you proceed to any of their offices for submission of some necessary documents as may have been advised on the job portal. Also the maximum age limit for OND holders is 24 years, while they allow 26 and 27 for HND. Your result as well must not be more than five years from the day of your application. The age limit varies amongst bank requirements. Work Force: Phone 01-279-8941, 01-279-8942, 081-68287195 email: info@workforceoutsource.com. You may have to find out about the rest. After interview and recruitment, successful candidates are required to provide at least 3 guarantors in various capacity as mentioned by the outsourcing firm. It is however in your best interest not to play a fast one by providing people who are not suitable as required by the firm as guarantors because they will investigate your guarantors irrespective of their destination. They spend a lot of money to do this by sending out their field staff to confirm if these guarantors are genuine again if they actually in their consent signed the said form for you. Getting these guarantors to sign is not always easy as they must be people who trust and believe in your integrity, conditions contained in the forms are really scary. Do not be offended if your supposed guarantor turn you down. You are required to go through medical to ascertain your fitness as the job you are about take is a highly demanding one which you must be ready to accomplish at all time. Then your offer Letter will be issued to you in good faith while you sign acknowledgement, at this point you must be very happy to have gotten a job with benefit, but there’s a huge task ahead accompanied with your new job. BANK TELLER JOBS: HOW MUCH CAN I EARN ON THIS JOB MONTHLY? The salary scale within this category is about 50,00 to 70,000 for OND, depending on the bank, while HND is 80,000 to 100,000 and so on depending on the bank seconded to. That being said however there are do and don’t surrounding your job. You are expected to display high level of integrity on this job, handling people’s money doing bank teller jobs is not an easy one, you are not expected to steal, you must declare overages and shortages that occurred on the course of your daily duty. Do not pilfer notes from packs if you are being caught the punishment is summary dismissal. You had better treat that money as paper else you will be on your fast lane out of the job. Congratulations in advance. Hope this is really helpful for all who want to pick bank teller jobs. Kindly help share this article.